This weekend I helped throw a baby shower for one of my dearest friends, who is due on April Fools’ Day! 🙂 Her baby’s nursery is going to be a “woodland creatures” theme, so we decided that so should be the theme of the shower! There were pine cones and fir tree branches in every corner, woodland creatures snuggled together on the mantel, and cutouts of forest animals hanging from the chandelier. We placed all the food on tree trunk “slices” and placed cupcakes in butterfly and flower paper muffin cups. What a fun time we had planning! One of my favorite parts of prepping for this party was browsing Pinterest for others’ ideas about what makes a good “woodland creatures” party. Who knew that there were so many ideas out there based around this theme? Forest birthday parties, woodland showers, fairy-themed extravaganzas… the list goes on and on! I found a ton of ideas for food, games, and gifts and used a few of them! Pinterest is a wonderful thing sometimes. 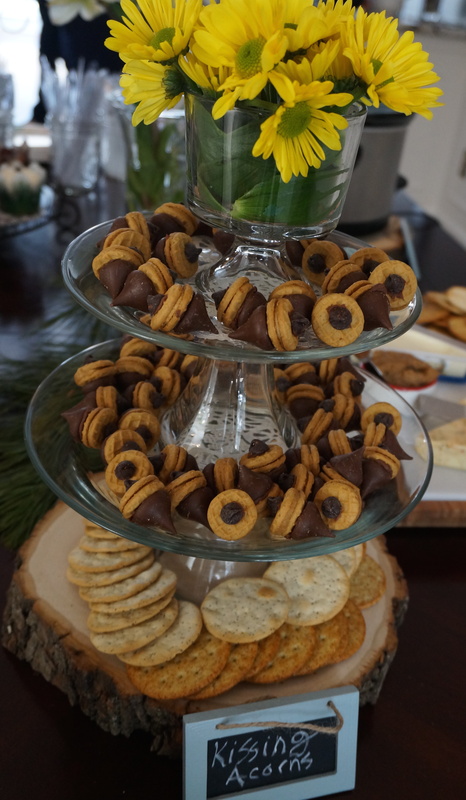 One of the recipes I found that I am absolutely in LOVE with was for these little candy acorns. How perfect! They have only four ingredients and are easy to assemble if you have a little bit of time! I got them all done on a snow day last week, and though they were a bit high maintenance to put together, SO worth it. 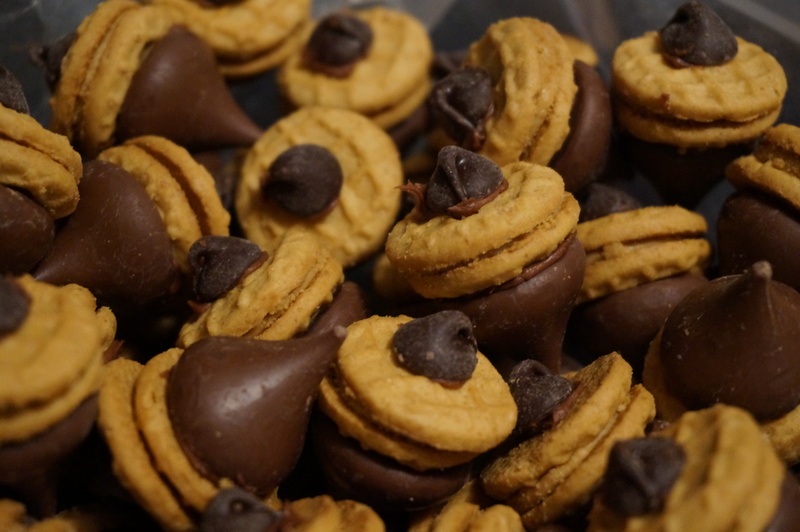 Basically, you just take mini Nutter Butter cookies and use a bit of chocolate frosting (which I was already planning on using for the cupcakes!) 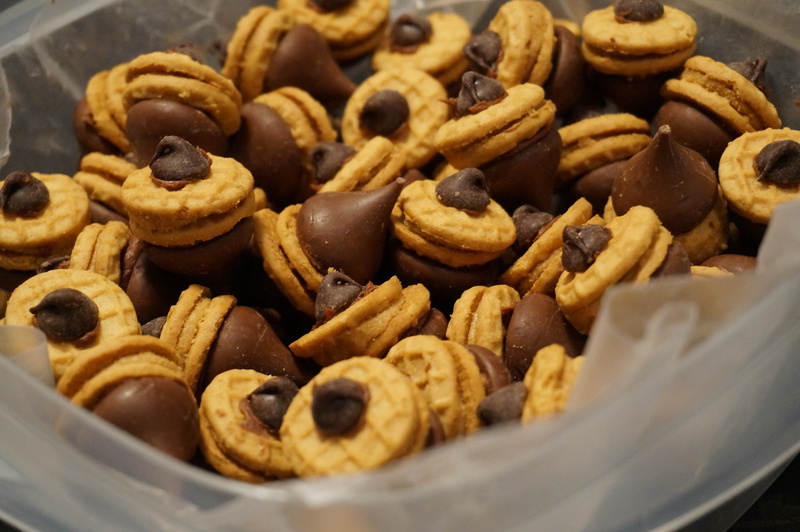 to stick a Hershey’s kiss on one end, then use a tiny bit more frosting for a chocolate chip on the other side. It’d be easiest if you have one of those little cookie decorating frosting tubes with a smaller opening… unfortunately I just had to use a knife, so it got a bit messy! Stick them in the freezer to set for at least an hour, or for a few days until you’re ready to serve them! One of my new favorites! If you have the time to assemble them, they will be a HUGE hit at your next “forest-y” party (or just for fun!). Spread a bit of frosting (you don’t need much) on base of Hershey’s kiss and stick on one side of the Nutter Butter. Add a bit more frosting onto the base of the chocolate chip and stick it on the other side! Freeze at least 1 hour and as long as a month, until you’re ready to serve!